This is our new house, it is located at the end of the channel down by the access ramp off Narrows road.. There is no beach here, but you do have your own private dock. It has many advantages such as two bathrooms, privacy and a laundry room. It rents for $560/week. 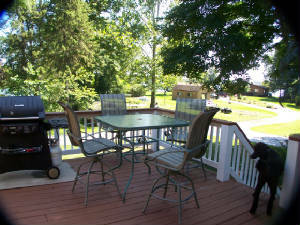 This house offers a large deck with enclosed area for outdoor entertainment. It has a large fenced in yard that surrounds the house. Plenty of quiet privacy here. located on the end of a short channel. You will have your own private dock. 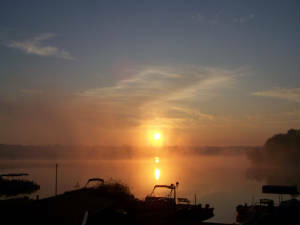 The deck offers a great chance to be outside and see the lake. This is the large spacious living room. This house comes with three bedrooms. 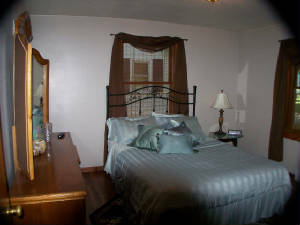 A master with a queen bed and a bedroom with 2 sets of bunk beds and a small room with an additonal full size bed. 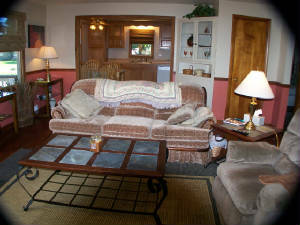 It also has two full bathrooms and laundry facilities.